Japanese Episode AG 039: "Utau! Pokemon Karakuri Yashiki!!" 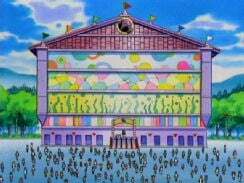 American Episode 311: "A Poké-BLOCK Party"
Satoshi and his friends have almost arrived in Kinsetsu City, but before they do they decide to stop at the Pokemon Trick Mansion. There, they meet up with a Gonyonyo trainer named Akina who accompanies them through the funhouse-like attraction. Following them into the Trick Mansion are the Rocket-Dan (dressed as a boy scout and a girl scout) as well as the Purin from the Kanto and Jouto days! Everyone eventually falls prey to Purin's song except for Gonyonyo, whose Soundproof characteristic prevents it from falling asleep. Everyone continues through the mansion, thinking of the one year supply of Polocks that await the winner. The Rocket-Dan get ahead by using dirty tactics, and before too long they reveal their identities to Satoshi and his friends. Akina uses her Gonyonyo to fight the Rocket-Dan, and Satoshi's Heigani finishes them off. The competition ends, and a young trainer named Shouta emerges victorious. As everyone watches the announcement, Purin appears and gives one more performance. When the pokemon thinks that Gonyonyo is sleeping because of its song, the pokemon gets mad and storms off. The Trick House (or Karakuri Yashiki, as it's known in the Japanese version) was a fun diversion in the video games, so it's only fitting that it would be a similarly entertaining diversion in the anime. The Karakuri Dai'ou was a really entertaining character, as were all the crazy challenges he had set up for our gang to stumble through. Even Akina managed to come across as somebody more memorable than the vast majority of the one-shot characters, even though she was most likely only created to compliment Gonyonyo. Another interesting aspect of this episode is everyone's favorite singing pokemon, Purin. I find it kind of weird that the anime would decide to bring the pokemon back into the anime after all this time. Where had it been all this time? And how did it get to the Houen region? We get no answers. I wish the story of the little balloon pokemon had been resolved, with Purin and Gonyonyo somehow ending up together (like being captured by Akina...? 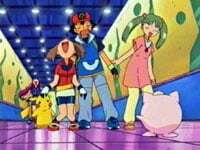 ), but instead the writers decide to leave the episode open-ended to allow the pokemon to come back. As far as the dub goes, we get the reoccurring problem that 4Kids has of not knowing enough about the game that the anime is based on. Take the Karakuri Dai'ou, for instance. In the Japanese versions of both the video games and the anime, the character is known as the Karakuri Dai'ou. In the American game, his name was translated to the "Trick Master." However, in the English anime, the character is renamed the "King of Tricks." Similar to Prima / Lorelei, Tabitha / Harlan, and Shelly / Isabel, 4Kids gives a character who already has an English name in the video games a completely new name for the anime. Besides that, calling the Trick Master the "King of Tricks" makes him sound like some kind of pimp or something. James: "But how many chances do I get to wear this?" Meowth: "Enough about your wardrobe malfunction! Let's get back to da Pokéblock!" Personally I liked James "two snaps up" line in the second half of the episode better because it seemed like a reference to the old "Men on Films" segments on In Living Color. But I guess the kids these days prefer references to Super Bowl half-time shows more than references to old sketch comedy shows from the early 1990's. Two seconds are cut from the opening shot of the episode. Alanna: "Hey, how come you didn't get your face scribbled on?" Max: "Whismur's protected from all sound attacks by its own attack called Soundproof!" Soundproof isn't an attack; it's a characteristic that's always in effect. Right after Kids' WB! 's final commercial break, there's a nine-second establishing shot of the outside of the Trick House that's cut from the dub. The shot was accompanied by the narrator talking about how Satoshi is going to head to the Kinsetsu Gym now that his business at the Trick House is over. The TO BE CONTINUED... screen is shortened by one second.